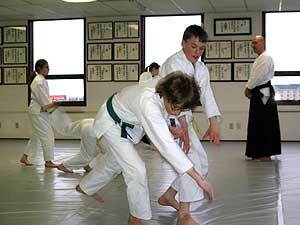 Aikido North provides three classes a week specifically for junior students ages 8 and up. Students can attend as many classes as they like and family rates are available. Class sizes range from just a few students to roughly a dozen, and are taught by two Instructors per class or by Sensei Koshiyama. Adult students are invited to attend the juniors classes as schedules permit. Classes are moderately energetic, with an emphasis on body control, flexibility and cooperation with training partners. Classes typically consist of basic warm-ups and stretching, moving to Aikido techniques and exercises, then ending with games that teach balance, cooperation, body control and sensitivity to your training partners. 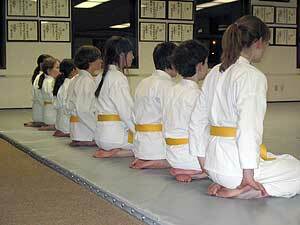 You can view photos from a typical class in our Junior's Gallery. Junior's class schedule is seasonal, meaning the Saturday morning class is not available during the summer break. Occasionally the junior classes will be suspended for the holidays such as Christmas, New Year's, etc. All schedule changes will be posted on the visit page and special events will be posted and notice given in class. Rank promotion examinations will be held after the student has trained a sufficient number of hours. Preparation and practice of exam techniques will be covered in the regular classes as the time approaches, and family is invited to attend on the examination date. You can view excerpts of past exams in our Movies Gallery, (junior's examinations are listed in an alternate color). We suggest you come and watch a class or two before you decide to enroll your child. Feel free to contact Sensei Koshiyama if you have any questions.